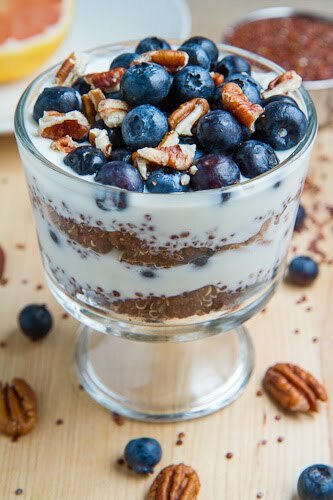 Quinoa used in a breakfast parfait layered with vanilla yogurt, fresh blueberries and toasted pecans. With summer almost here there has been a near constant supply of berries in the stores and this week blueberries were on sale so I picked up a bunch of them. After polishing off a significant amount of them just by snacking on them plain I decided that it was time to do something with them and I knew exactly what that was, a breakfast quinoa parfait. I am a big fan of quinoa and I am always looking for new and interesting ways to use it and the idea for the breakfast quinoa parfait has been on the back of my mind all winter just waiting for the fresh summer berries to show up. The basic idea for the quinoa parfait was to layer quinoa with yogurt and berries and after that you could add pretty much anything else that you like. Since I was using blueberries this time I decided to pair them with some toasted pecans and to use vanilla yogurt though I was also contemplating on going with plain yogurt and then topping the whole thing off with maple syrup. The soft and tender quinoa worked surprisingly well in the breakfast parfait with the creamy yogurt and the juicy blueberries! One of the good things about making this for breakfast is that you can cook a big batch of the quinoa on the first day and then just pull it out of the fridge and whip up the parfait in a few minutes for the next few days. I am definitely looking forward to making more of these this summer! Bring the quinoa and water to a boil in a medium sized sauce pan, reduce the heat and simmer covered until the water has been absorbed and the quinoa is tender, about 15-20 minutes. Chill the quinoa in the fridge. Assemble the parfait by layering the quinoa, yogut, blueberries and pecans. I'm sure it has been said before, but if you ever fancy getting out of that closet, you can come and cook for me! Delicious! love quinoa! i've never tried it in a sweet before, i bet it's awesome. This is such an awesome idea! Yum! I just recently discovered quinoa and this recipe sounds scrumptious. Fresh fruit and I have become very close these past few weeks…I just can't stop eating it! Great idea to use it in a breakfast parfait! Very creative. I tend to use quinoa in salads or savory dishes. Never tried it in a sweet dish. Will definitely have to try! I just cooked a pan of quinoa, this is going to be my lunch today. Thanks for so many fantastic recipes! Thanks Kevin, love this recipe, will definitively share it!!! This is a great idea!! I have been a vegetarian for about 10 years but for whatever reason I never explored my food options much beyond processed soy products and I am looking to cut down on the processed junk. I am new to the wonderful world of quinoa but I LOVE IT! I will have to give this recipe a try. Thanks for sharing the idea!! Oh this looks so delicious! I would love this for breakfast or as a dessert! Yum! Did you really mean 2 servings with this recipe! It is almost 700 calories. I changed it to 4 servings and am satisfied. Never done the breakfast quinoa but I really should! I'm not a huge hot oatmeal fan so this sounds perfect. Can I assemble the night before? This never would have occurred to me in a million years, so thank you for broadening my horizons! It looks delicious! No posts in a week? What's going on over there, Kevin? Everything okay? This looks fabulous; I love quinoa…such a great recipe, Kevin. Hope you are well. I really enjoyed meeting you at the Dole Summit and at BlogHer Food the past two months. Have a great summer and hope to see you again soon! I do use quinoa for breakfast and cook them with dates, but your parfait is so very pleasing beautiful. Brilliant idea! Haven't stopped by your blog in a little while, and you've been busy – so many new recipes featured! This quinoa parfait sounds pretty perfect as a healthy brunch option! Enjoying this for breakfasts this week. Brilliant! I never would have thought of using quinoa in breakfast parfaits. Love your blog! Looking forward to following along and making a lot of your recipes. Thank you! Love parfaits, and quinoa…this one looks great! A must try indeed! Thank you, Kevin! Your fruit & quinoa parfaits are a new favorite breakfast. I have been putting a cinnamon stick with the water and quinoa so that the grain is cinnamon scented. This is great with every berry I've tried. Anonymous: Glad you enjoyed it! I also like to add cinnamon to the quinoa while it cooks! What an amazing aroma! Kevin, I love this recipe..easy to do but so delicious! What a great idea for breakfast…thanks for sharing!